I have to admit, Storm in a Teacup is a pretty ballsy name. It basically boils down to a small event exaggerated out of proportion. It begs the question, does Cobra Mobile have a severe case of narcissistic overconfidence? The problem with a name that implies that it’s something special is it backfires if the expectations it creates aren’t met. So, does Storm in a Teacup live up to its name? Or does it fizzle before it pops? Well faithful reader, I guess you’ll just have to continue on to find out. 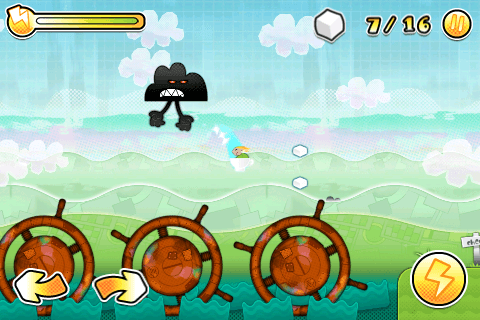 Storm in a Teacup is a pretty standard 2-D platformer. In-fact, if you’ve played just about any platform game in the past 20 years you basically know what to expect. You control Storm, as he rides around in a Teacup, for reasons unbeknownst to us, moving from left to right, all while avoiding obstacles such as clouds with angry faces, spikes, buzz saws, barrels and the occasional boss thrown in for good measure. There are 40 levels to navigate through and if you can manage to finish a level without dying and finding all the items you’ll earn a “perfect” and get to see your best completion time. 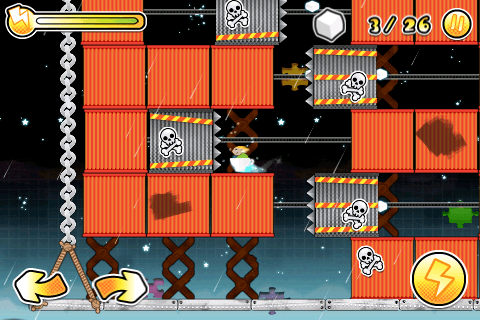 There’s also Game Center and Crystal integration which provides you with leaderboards and a list of achievements. 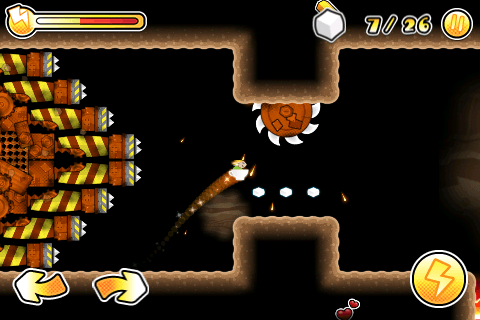 The on-screen controls work pretty well, if a bit floaty. You have a left/ right arrows for navigation and a single button for jumping with a meter that depletes the longer you hold the button down. You’ll have to learn to feather the jump as the game progresses a single burst doesn’t always get you to where you want to go. Littered throughout the games standard level affair are a few shooting segments, which I really wish there were more of. These small bursts really felt fresh to me, mixing things up and paying homage to classic games all while the overall platform level design came off a bit mundane. 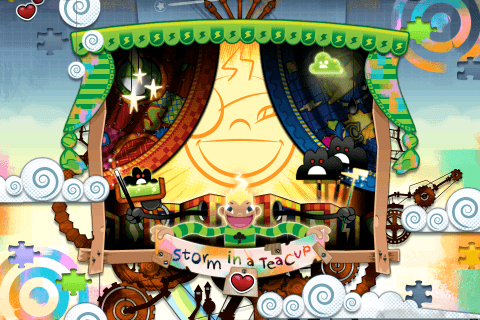 If you get tired of the main campaign, Storm in a Teacup has 5 survival levels. These wind up being a small distraction more than anything else, but the overall mechanics of the game are fairly solid and they do provide some fun, if short-lived. Graphically, this will be polarising. Personally I appreciated what the team was going for but I feel they missed their mark. Everything in the world seems derivative. The design is certainly very Nintendo inspired with lots of vibrant colours and settings. However, it lacks the charm and nuance of Nintendo’s typical art direction. The main character has the least amount of character in the game. Aside of some small hair movement he doesn’t have any animation which makes him feel very lifeless. The clouds with their angry faces have more animation and character than Storm, which is a severe misstep. The music matches the overall setting pretty well with a light and friendly vibe. Unfortunately, there really isn’t much verity with the same couple of tunes repeated throughout the campaign. The game is fairly short, clocking in at around 3 hours so it’s a short lived complaint at least. I certainly have some issues with Storm in a Teacup. Mostly because I feel it’s just a bit half baked. If Cobra Mobile let the game cook for a little while longer and really worked on the art direction and polish they really could have had something special on their hands. But as it stands, the game is rife with mediocrity, which is a shame. However, at the end of the day, it’s at an appropriate price point and is a solid effort for what you’re paying for. I just wish it were more. Evil Megalomanical Super-Villain hell bent on taking over the world.